Who do we look to? DuBois saw the Tenth as the one out of ten Black men that would help pave the way for racial equality in America. He believed that this ten percent of the population would lead the Black Cultural Revolution into the American narrative and allow those of a brown hue to be seen as a true equal. Over time, progress has been made and the times have certainly changed, but not everyone is seen as equal and the end goal has not been reached. It led me to ask the question: What does today’s “Talented Tenth” look like? Does it exist? Do we need it? And if it does exist- who is it? I frankly do believe the “Tenth” exists today although I think the distinct color and gender lines DuBois imagined have certainly blurred since 1903. The “Talented Tenth” are the people who set the tone for Black culture, politics, arts and thought- but as I thought about who those people are today I became concerned. I think in the arena of politics, we’re okay- I say okay loosely as I think it’s far from good. The election (and subsequent re-election) of President Barack Obama was HUGE and a display that a Black politician CAN in fact be elected to our nation’s highest office. Politicians like Cory Booker and Tim Scott in the Senate and Members of the House of Representatives in the CBC, regardless of their political affiliation are a sign of some progress. But out of 535 Members in the House and Senate combined barely over eight percent are black (despite making up nearly 14 percent of the population). These numbers are revealing which I certainly plan on exploring in more depth in a later post- but are these people really the ones driving our culture? Unfortunately, no. Artists and the arts, in my opinion are the main vehicle’s that the majority of the populations sees as driving culture. In the DuBois era (granted not necessarily when he coined the term), we saw the Harlem Renaissance- in which artists, musicians, dancers, writers and thinkers were driving intellect, entertainment and bringing Black culture into vogue while making a socially conscious history at the same time. The Harlem Renaissance is the perfect frame to segue into today because, well- we don’t really have that anymore. What made the Harlem Renaissance so great was how POPULAR these people were across cultural lines. The best comparison would be today’s celebrities. They drive culture, fashion, and ultimately dictate what we consume along with how and when we consume it. Black Enterprise highlighted (exposed, really) what Black’s consume (on television) and it brought to light a #Facepalm worthy problem. Fake reality TV shows and WWE dominated the list of what Blacks watch. 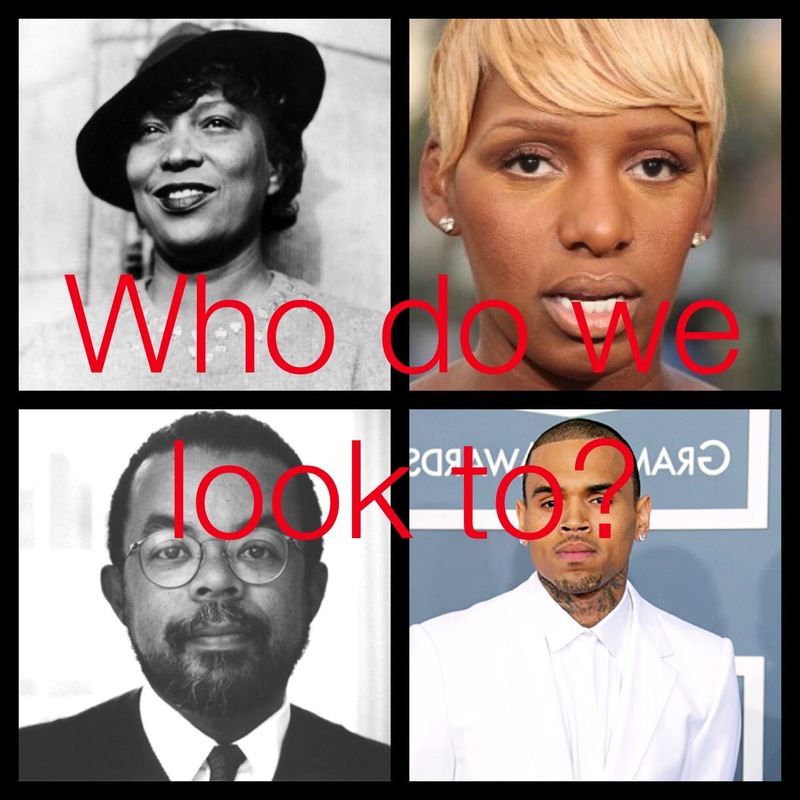 I’m sorry but Nene Leakes is no Zora Neale Hurston. Kofi Kingston is no Langston Hughes. Lil’ Wayne has over 17 Million followers on Twitter and Chris Brown isn’t too far behind with nearly 14 Million. Regardless of their music talent, these people- known for illegal drug usage and spending time incarcerated for crimes they did in fact commit are the ones in the driver’s seat of our culture. Compare that to Harvard Professor Henry Louis Gates Jr. who has 28,100 followers on Twitter. Compare that to Professor Melissa Harris-Perry who has 300,000 followers. Compare that to Princeton Professor Cornell West who has 571,000 followers. The comparison can go on and on and on but the bottom line is shouldn’t it be the other way around? I’ll throw in the disclaimer that I do listen to music and may (or may not) follow these artists online. My gripe comes because I see too many people look at these people as the leaders of our culture and they set an awfully low bar. So what is the answer? I guess do we even have a problem that needs to be solved? Certainly, no one is perfect- but I think we can do better with our imperfections. It’s a matter of opinion, but I think the “Tenth” is certainly there but it’s time to shift the emphasis on who is really in control, who we really look to.